Accelerate young children's participation in early language-learning with these storybooks that teach key skills in a developmental progression. The skills advance within each book and between the books, giving professionals and caregivers a teaching framework. The captivating illustrations and carefully crafted text prompt verbal expression and provide an enjoyable way to interact with young children. Action WordsFocus on early actions and use present tense verbs (e.g., run); present participle verb forms (e.g., running) in forming simple sentences. Describing WordsDescribe common objects and learn early concepts through opposite pairs (e.g., big/little, clean/dirty). Wh- QuestionsChildren understand and answer simple "what" and "where" questions. Illustrations aid comprehension. Answers to the wh- questions reinforce spatial concept skills (e.g., on, under). PluralsDifferentiate singular and plural nouns with illustrations of "one" and "more than one" objects. One-word text on each page helps children focus on the concepts and the morphological /s/ word ending. PossessivesTarget possessive nouns (e.g., Daddy's, Mommy's, doggy's) in simple sentences. The story sequence is an engaging game-like format: "Whose hat is this?" "Not daddy's hat!" "Not doggy's hat!" "Mommy's hat!" Basic Sentence StructureTarget the sentence structure, "I see a _______" through repetition and visual prompts (e.g., "I see a house." "I see a shoe."). Rebus pictures with the text help children reproduce the sentence structure. 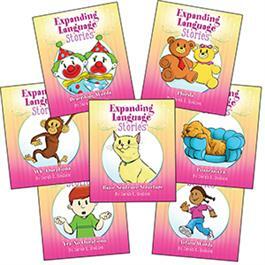 To target the prerequisite skills of imitation and forming first words, see the companion seven-book set, Early Imitation & Emerging Language Stories.